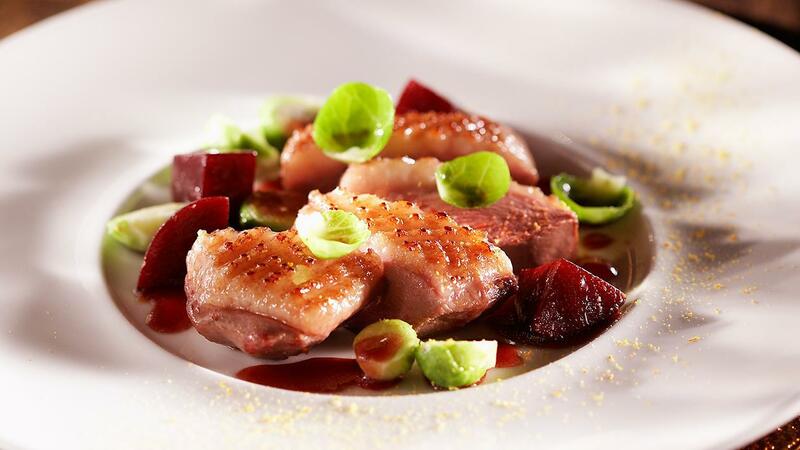 The beetroot and balsamic are a great combination when matched with full flavour of the duck. The dried orange peel forms a wonderful combination with the beetroot and the duck. Make cuts crosswise in the fat of the duck breasts. Season the duck breasts with salt and pepper and fry them starting in a cold pan to render fat. Cook the sprouts until tender and season to taste. Carve the duck breasts and arrange them on the plates. Scatter the beetroot with the dressing and the sprouts over the plates. Grate the orange peel over the dish just before serving.